1.Print the free St. Patrick’s day designs onto separate sheets of Dovecraft vellum. Slowly feed your vellum through the First Edition foil machine. We have used First Edition green and gold foil for this card. 2.Round the top left and bottom right corners of the card blank. 3.Cut a 17.5cm 12.5cm rectangle from the First Edition Love Story paper pad. We have used the wood effect design for this make. Round the same edges as you did on your 5x7 card blank and adhere to the centre of your card to allow a small border around the edge. 4.Cut a 14cm x 7.5 piece of white cardstock as a tag and round each corner. Following the same measurement as the tag, cut a piece of foiled vellum to fit the tag. Cut out the Good luck sentiment. Place all three together and punch a hole in the top. To hold your tag and vellum together, thread through a piece of twine. Glue your finished tag to the card blank at an angle. 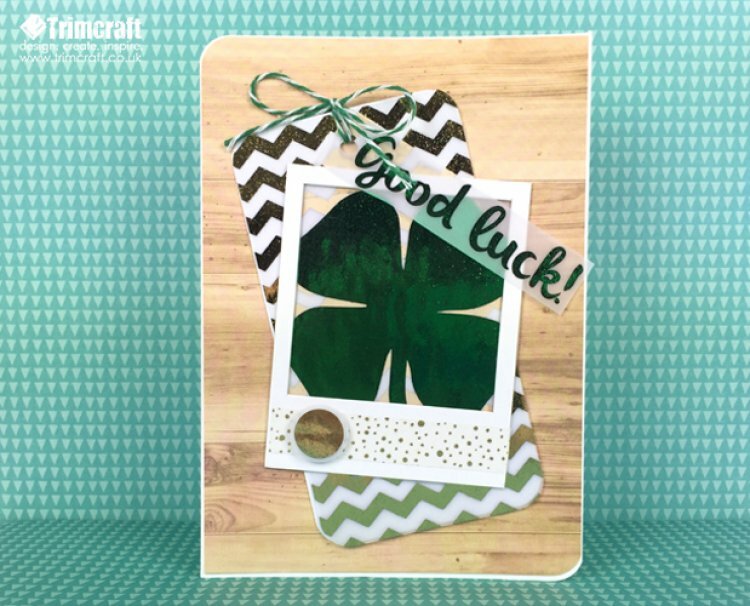 5.Cut out the foiled shamrock, to fit behind a Dovecraft frame, adhere to the back of your frame using double sided tape.Glue the frame to your card blank at a slight angle. 6.To finish, add a strip of washi tape to the bottom of the frame. Cut out the foiled dot and stick to the bottom left of your frame using a 3D foam pad. We love the range of materials in this card, you can’t not love a mix of washi tape and foil! Plus, it’s great inspiration for any good luck crafts you plan on making! Join in with the St. Patrick’s day festivities and make sure to upload your makes to the project gallery!